Cardiovascular exercises are great for burning fat. When your aim is to lose weight, it all comes down to a treadmill or a spinning bike for indoor exercises. These exercises raise the heart rate and burn off the calories. Both of these exercises provide great benefits for diabetes, stress, depression, and offer relaxation. But the question remains: spinning vs running: which one is better? What is a spin bike good for? When you’re using a spinning bike, your quadriceps, glutes, calves, hip flexors, and shin muscles get worked out. The pedaling directly works on your quadriceps and with extra resistance, you can form muscles. Set the resistance to 60 revs/s, so your quadriceps and hamstrings can work on your “moving forward” motion. Some modern and top rated spin bikes offer digital display and program feature. You can also incorporate interval training into your workout since it targets the lower legs more effectively. During the intervals, you can pedal while standing. Running on a treadmill puts the entire body to work and not just the lower half of the body like a spinning bike. Since you’re pushing your bodyweight in a forward direction, you’ll be able to burn more calories. If a 165-lb person walks quickly on a treadmill, he’ll burn around 565 calories. If he does an incline, he can burn 700-800 calories. And if he runs on the machine, he can burn 800-1000 calories. If you can change your pace during walking or running on a treadmill, it will be 20% more effective. There are many benefits of spinning for weight loss but it requires more work. If you cycle for about an hour, you can easily burn 250-700 calories. Don’t work on your pedal too fast. If you go 110 revs/s, only 40% of your energy will get utilized to propel the bike forward and 60% of the energy will go into pedaling. You’ll also benefit from the bike more than you can on the treadmill when you’re working your joints. Running often stresses the spine, knees, hips, and ankle joints. But anyone with a dodgy knee can work on a bike. Working on a bike will provide the perfect cardiovascular workout without stressing the joints. Running on treadmill helps burn more calories than a spinning bike using the same intensity. This has a lot to do with your positioning on the machines. Since the seat on a spinning bike supports your weight, you don’t have to put much effort into it while working out. But when you’re on a treadmill, you have to propel your entire body with its weight. This accounts for a more rigorous calorie burn than a spinning bike. Is riding a bike good cardio? Although you can burn more calories on a treadmill in much less time than on a spinning bike, you can work more hours on a bike which is good for your cardiovascular health. Since you don’t have to put too much pressure while you’re on the spinning bike, your joints are comfortable and you feel like working out for longer. There are also variants of exercises available in a spinning bike. You can always work on the bike for a longer period of time to meet the calorie burn you’d get on a treadmill. 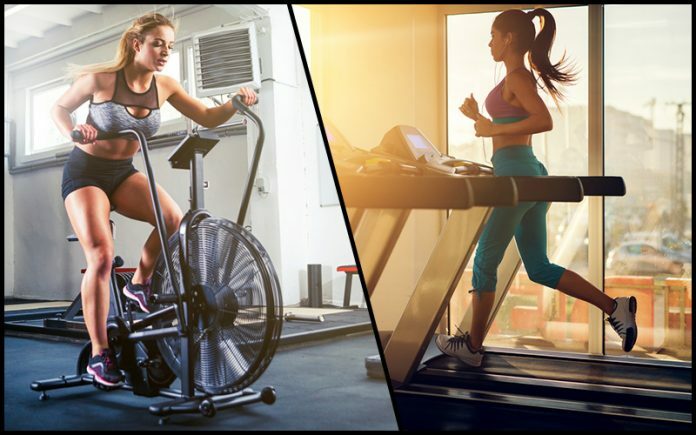 You can perform High-Intensity Interval Training (HIIT) on both treadmill and spinning bikes. HIIT is the most effective way to reduce abdominal fat while retaining muscle mass. Both of the machines come with models that have built-in HIIT programs in their consoles. These programs work as great guidelines for your training. But the benefits of spinning everyday surpass the benefits of using a treadmill in terms of HIIT. We’ve provided an overall comparison of both machines and talked about which machine serves which purpose best. Now, we’ll take our spinning vs running discussion one step further by overviewing each of their benefits and advantages separately. You can control the speed, warming up and cooling down periods, how much energy is going to be spent, incline, etc. Great for burning calories and fat with incline feature. If you’re still wondering “is spinning a good workout,” we’ve compiled a list of both spinning benefits and disadvantages. Read our points before you go for a spinning bike for yourself or get yourself into a spinning class. How to Get the Most out of Both? Most people who take on one of these exercise machines usually go for burning calories and losing weight. You can select any one of the machines and work your way out towards your goal if you push yourself enough. You can start with simple jogging on the treadmill and gradually add incline to it for sprinting to get the most out of the machine. As you can see, the chart shows the resemblance of the exercises. They’re quite similar in terms of the muscles they work on. However, the effect they have on the user’s body depends on the user’s age, body type, and health condition. For achieving good cardiovascular health, toned legs, less weight, and less fat, spinning and running come at the top of the exercise list. The spinning vs running debate is legit but banal at the same time since a lot of issues dictate for a person which machine is best for him/her. In terms of choosing a machine, you have to understand which machine is going to suit you best. This essentially means the exercises you feel comfortable doing and are going to keep doing. You also need to consider why you’re exercising. If you simply want to lose weight and you don’t have any issues with your back or joints, go for the treadmill. But if you also want to build up muscles and you have back or joint issues, go for a spinning bike for a more strenuous workout. 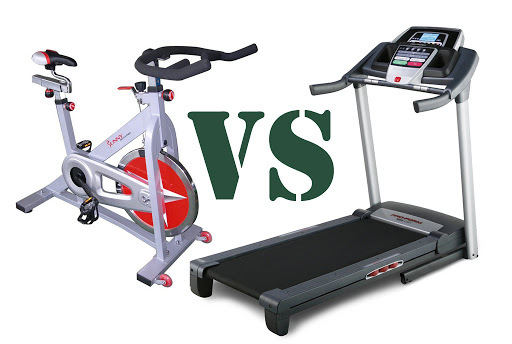 We hope we’ve helped you with your confusion on exercise bike vs treadmill. Previous articleBinoculars vs Monocular: What Should You Choose?